The title says it all, I've had a busy weekend. The good news is a lot of it has been busy with stamping! 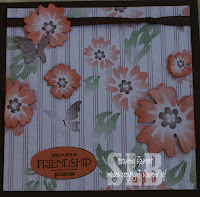 Besides putting the finishing touches on my Stamp Club projects for next weekend, I sat down and worked on some projects that I hadn't had time to do all week. Here's one sample from yesterday and I have to say that when I started this project I wasn't sure where I was going with it. All in all, I like the way it turned out but for me it's hard not to like anything made with the new, yummy Afternoon Tea DSP from the Occasions Mini Catalog.